On the night of Sunday April 14th 1912, the White Star Line's 'unsinkable' ship, the RMS Titanic hit an iceberg and began to sink. Between then and her demise on the ocean floor some two hours and forty minutes later, wireless operators Jack Phillips and Harold Bride sent out a distress signal. The signal they sent combined the international distress signal of the time; CQD (a signal used by Marconi wireless operators) and the less well known SOS signal (which was a new signal, not regularly used by British ships, but had been used prior to Titanic's sinking, despite popular belief that this was the first time it was used). Their distress signal was picked up by four ships in vicinity, but even the closest one, the RMS Carpathia (at 58 miles away), did not arrive in time to make a successful rescue of all of Titanic's passengers. The SS Californian was close enough to see the lights of Titanic, but had shut off their wireless system for the night. The only place on land, it is believed, to pick up the distress signal was at Cape Race in Newfoundland, to the north-west of Titanic's position. Artie was a native of Pontllanfraith, a place near the town of Blackwood, Wales. At a young age he was disabled by an accident at his family's mill, which left him with a wooden leg. So unable to do much he spent his time developing amateur engineering projects. It was here, at the Gelligroes mill that he began work on his home made wireless device. 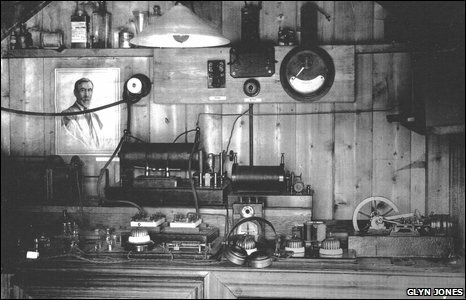 This was around 1910, and it is believed that Artie, along with an engineer friend Richard Jenkins, developed the first wireless used for business communication in Welsh history. The next year, Artie became quite famous after he discovered the transmission of Italy's declaration of war on Libya. But it was the year after this, in 1912, at the age of 26, that Artie's wireless skills had developed to such a level that enabled him to intercept the Titanic's distress call. Artie notified locals and the police of the distress signal, but no one paid attention. It was believed at this time that a wireless such as the one used by the Titanic could only transmit up to 2000 miles (in darkness). To have reached Artie the signal would have to have travelled 3000 miles, and be picked up by his home made wireless system. But two days later the news hit the UK. And Artie's knowledge of Titanic's combined use of the CQD signal and the lesser known SOS signal, proved the worth of his declaration.